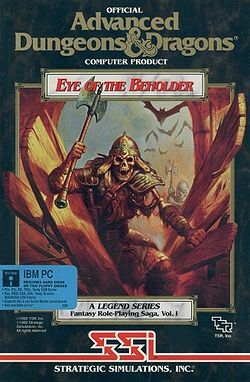 Eye of the Beholder is a trilogy of RPGs developed in the early nineties, the first two by Westwood Studios that would later be known from games such as Command & Conquer, and the third one by Strategic Simulations Inc., that also published all three games. The games use a simplified version of the rules for Advanced Dungeons & Dragons 2nd edition, in the Forgotten Realms campaign setting. All games are first-person, and feature an adventure party, between four to six members, going on quests and fighting evil. The first game has them hired by the lords of Waterdeep to investigate an evil residing under the city. It had an Absurdly Spacious Sewer, not just one but two ruins of lost civilizations beneath Waterdeep, and an infamous ending, where the player was treated a window of text before dumping them back to DOS (the Amiga version, however, added a proper ending cutscene). The second (The Legend of Darkmoon), generally thought to be the best of the series, involves the party checking out an ancient temple for Khelben "Blackstaff" Arunsun. It offers more roleplaying content, and a more proper ending. The third game, sends the player into the ruined city of Myth Drannor. It was not made by the original developers, and is generally considered a massive disappointment. A spiritual successor, Lands of Lore, was created by Westwood in lieu of a third Eye of the Beholder after the split with SSI over creative differences. A remake of the first game was released for the Super Nintendo, and later for the Game Boy Advance. It was also ported to Mega CD, with music composed by Yuzo Koshiro. Note that this remake diverges quite a lot from the original game, both in game mechanics and in that it adds sub-boss enemies. '80s Hair: The drow named Shindia Darkeyes has a frizzy head of hair. Absurdly Spacious Sewer: The first game begins in Waterdeep's sewers. It's inhabited by kobolds, giant leeches, zombies and skeletons, as well as flinds and kuo-toas. Antidote Effect: In the first game, you can find potions of counterpoison in the Giant Spiders level. Quite necessary, since at that time your cleric isn't high level enough to cast Neutralize Poison, only the weaker Delay Poison spell, which just gains you some time. Arbitrary Headcount Limit: You start the game with four characters, even when importing to the sequels. You may get up to six. The second game also has an NPC that runs off, but he won't do it if you reduce your party size after recruiting him. Xanathar's can be exploited — as well as the doors' tendency to block all projectiles, including magical ones — to fight him in relative safety since he can't open the doors (which also allows you to rest in the middle of the battle). A lot of enemies follow a given pattern of movement and don't change it unless having a straight line to the party, or being themselves attacked. This include enemies patrolling behind a door; some doors allows projectiles to go through, but the target won't change its pattern or open the door even if pelted with arrows. Boss Arena Idiocy: In the first game there is a very obvious trap in the same area where you encounter Xanathar: a wall niche full of treasure with an enormous blood stain in front of it. At least you can only get him there with the Wand of Slivias, but would you live in an apartment that just happens to have a death trap in one corner? Bragging Rights Reward: In EotB3, an optional dungeon called The Mausoleum near the start of the game gives you a "Rod of Restoration" as a reward... guess where the only enemies that use what it cures are. Clingy MacGuffin: There's a few undroppable cursed items in EotB2 that will weld themselves to your hand. However, getting rid of them just require one Remove Curse spell, which is accessible to both mages and clerics. So it's only a problem if your characters are too low level to cast it (or can't rest and regain spells, but then you have a much bigger problem on your hands). Control Room Puzzle: Subverted in EotB1: in one of the later floors, there is a room labeled "Combination Lock — Be Quick" with 5 switches and a group of items on the other side of a pit (by this point, the game has already established that pits can be moved or gotten rid of entirely). Each time a switch is hit, the party must move quickly to dodge a fireball that gets launched from the other end of the room. The player obviously thinks that they need to find the right combination to get rid of the pits; the catch, though, is that it's actually impossible to remove the pits, the switches do nothing, and it's just an excuse to frustrate the player. EotB2 has two No Exit examples. To make it all the more frustrating, both of them also give you very good magical equipment, which easily leads the player to think there must be some way to get out and keep the stuff. In Temple Level 2, placing three gems in a niche opens a secret passage. If you go through it and into a treasure room, the passage closes behind you and you're trapped forever. In a room on Silver Tower Level 2, if you kill a dying Darkmoon cleric, the door out of the room closes and traps the party inside permanently. Reload your last saved game. EotB3 has a down staircase, which leads to an infinite dead-end room if you go through without completing some action first. Between the first two games, beholders. Xanathar is the Final Boss of EotB1 and the only one seen in this game; in EotB2 there's a dungeon level full of them. Your party should be high level enough to handle them at the time, but they're still to be fought with caution, especially when confronted by a pair. The first guardian daemon you encounter in EotB2 is a MacGuffin Guardian, and a dangerous fight since you confront it at the end of a section where you can't use magic or healing. (Plus, it's a lengthy corridor where you have nowhere to hide from its fireballs.) Later in the game, though, guardian daemons are the standard monsters of a level. Detect Magic: A standard spell to determine which of the items you found are enchanted, by giving them a blue glow. It doesn't give any further information, though. The magic dagger Guinsoo, obtainable in the very first level of the original game. However, you may never figure out how to get it... Although it sounds impressive to have a +4 weapon at low-level, it really only deals 5 to 8 points of damage on a hit. Also, you don't know it is a +4 weapon, this might be more of a Guide Dang It! territory, at least until you reach the Identify Alcove, which you don't know is an Identify Alcove. For the entire series, the first game contains several +5 magical weapons which you can import along with your party. Presumably even the developers thought that was overkill in hindsight, as the sequels have nothing higher than +4. Disintegrator Ray: The Disintegrate spell, and the beholders' most deadly attack (although, see Normally, I Would Be Dead Now below). Double Meaning: Deep in the first game, at the start of the Mind Flayer level, a wall engraving reads "Alignment must be true." Since this is a D&D game, you'd expect it to be a cryptic mention aboutinvoked Character Alignment. In truth, it's a hint about how to open the next secret passage, which is a the end of an alignment of hidden doors. Dummied Out: There is a removed area in the very first level of the first game, containing a portal and an unused portal key. Endless Corridor: EotB2 features a seemingly endless corridor in an already frustrating level, thanks to one of the "sneaky teleporters" of the game, who sends the party back a few squares with no visual clue. Leaving an item on the floor allow one to realize what's going on. There's no way to ever reach the other end of the corridor. Fireballs: Not only the spell itself, but there's also plenty of traps that would launch a fireball at the unlucky victims. Food as Bribe: The consumable Kenku eggs found on level 7 can be used to bribe the Drow guards, making them abstain from attacking you. Giant Mook: EotB2 places frost giants within one of the dungeon levels. They are crawling within the 10' cube, and are able to hit three characters in a single punch. The Goomba: The kobolds in EotB1. Help, I'm Stuck! : In EotB2, there is a round hole in the ceiling allowing to rise up to the next floor thanks to a "whirlwind" button. When found, a beholder happens to be stuck inside, with just its mouth, central eye and a few eyestalks peeking through. It asks the adventurers for their help to be unstuck — one of the rare times a beholder deign speaking to the party rather than attacking on sight. Interchangeable Antimatter Keys: The "antimatter" part is handled by the keys being jammed in the locks. The third game actually averts this in several spots. A puzzle sequence in the first game includes a part where you must jump down a pit in order to continue, an act that would normally injure everybody in the party. A nearby wall engraving reads "one leap of faith", and upon actually jumping down the pit, the party takes no damage. In EotB2, there is a puzzle for which the clue is given of "faith is the key." In the puzzle, a sequence of four doors in a corridor must be opened by pulling four levers such that each lever opens a pit in front of the previous one, meaning that the fourth door-opener lever is inaccessible across a pit (albeit not a bottomless one, since the game doesn't have those). The trick, in this case, is to open the first three doors, walk down the partially opened corridor, and push a misaligned brick on the wall, at which point it becomes possible for the player to walk on top of the pit in order to pull the fourth lever and open the last door. Level Grinding: Some actions or locations will spawn monsters regularly and predictably. This can be used to grind XP pretty quickly with a party properly prepared for the specific enemy, if you're patient enough. The most useful place early on is the kenku (bird-men) level. They're worth a lot of XP but are not terribly dangerous once you neutralize their main attack (Magic Missiles) with a pair of mages protected by a Shield spell in the front row. They also spawn regularly in a level you can easily leave to rest in a safe place and return. In the deepest level, there's a spot where you can create stone golems at will, as long as you have black spheres, stones and potions (any potions, including some pretty useless ones by this level like healing or counterpoison, or even poison potions). Golems are dangerous because of their immunity to offensive magic, but are slow and can be handled with projectiles and your mages focusing on Status Buffs instead. There are spots where a Will-o'-Wisp or a bulette will automatically appears as soon as you step in. Dangerous monsters in either case, but once again worth lots of XP, and easily handled by a well-prepared party. Deeper in, a specific corridor automatically surround the party with a pair of mages. Trickier, but since they're Squishy Wizards and always open the hostilities with Magic Missiles, you have a good chance of killing one and getting out of the way before the other pulls out the Fireballs. At another place, a salamander will be behind a door every time you walk before it. With enough Cones of Cold, you can kill it before the door is fully open. Literary Allusion Title: "Beauty is in the eye of the beholder" is a phrase from the 1878 novel Molly Bawn. Locked Door: The first game has a handful of locks that you can pick, but only on the second level; and if you happen not to have a rogue in your party, the game adds extra keys so that you don't need to pick them. MacGuffin Delivery Service: EotB3. A mysterious figure sends you off to kill a lich. Once you finally manage, it turns out to have been a good lich (despite the fact that he, you know, tried to kill you) and the mysterious figure teleports in, gets an unnamed MacGuffin, reveals himself to be the evil dark god, and flees. The rest of the game is spent chasing him. EotB1: Explosives Runes blast in your face when read (but only in the remakes). EotB2: Gas spores explode like a fireball if they take even a mere scratch. Master of Unlocking: The thief class, but not really. Most locks in the game are unpickable, and for every lock that you can pick, a key will be added if your party doesn't have a thief. Meaningful Name: Dran Draggore is secretly a dragon, duh. The rust monsters in EotB1 will eat any metal item. The gelatinous cubes in EotB2 can also destroy items on a hit. The black puddings in EotB3 will eat your weapons if you attack them in melee. Moon Logic Puzzle: Every dungeon level of the first game has a special secret that you can discover if you perform a specific sequence of actions on that level (the first level's is the aforementioned Disc-One Nuke)... and the game only gives very obtuse hints about what those actions are. For example, put rations in the closet labeled "pantry", or eggs in the room labeled "nest". Mission Control Is Off Its Meds: In The Legend of Darkmoon, the last time Khelben Blackstaff contacts you, it's actually the bad guy in disguise. He tells you to go to the next room and drop dead, almost literally. Considering your last conversation was abruptly cut off by a magic barrier, it should be fairly obvious that something's fishy — in the Amiga version, it also plays distinctly different background music for the cutscene. The complete disappearance of the Stoneskin spell in EotB2, even with an imported party from EotB1, for whom it vanishes from spellbooks (and a Stoneskin scroll can't be saved either). See the Game Breaker entry for why. The Turn Undead function also get modified between the two games, as mentioned below. Normally, I Would Be Dead Now: In EotB1, Xanathar's Disintegrator Ray, by AD&D rules, should kill instantly, but instead inflicts exactly 100 HP of damage. No One Should Survive That, right? Well, except if you have a high-level dwarf fighter with 19 in Constitution and the maximum possible on each roll (thanks to Save Scumming and Level Grinding)... that character can perfectly have more than 100 HP by the end. Old Save Bonus: The sequel can be started with the party from the first game — along with all their equipment, containing a significant amount of weapons and armor that outclass everything available in the second game. If you play it right, you end up with at least three +5 weapons and a dozen +5 darts, whereas the best weapon available late in the sequel is only +4. Our Dwarves Are All the Same: Most of the NPCs that can join you in the first game are dwarves. All are fighters with An Axe to Grind and preferring heavy armor, practically identical except in stats. The dwarves that can be seen in large amounts in their camp are, other than a single exception, literally all the same: your basic bearded, heavily-armored, axe-wielding type. The Paralyzer: Several monsters have this power. Most annoyingly the thri-kreen, which are so fast that almost without fail one of your front-row fighters will be paralyzed before even having the time to strike on his own. The mind flayers' psychic blast is a distance paralyzing attack, and can affect several PCs at once. Your cleric better have several Remove Paralysis spells ready... and if the cleric himself is paralyzed, you're out of luck. On the other hand, if a beholder just paralyzes some members of the party, you've gotten off lucky. Permanently Missable Content: In the first game, on the Drow levels (Floor 7), there are three small rooms behind doors close to each other, each with a rare magic item inside: "Slicer", a short sword +3; a set of +3 bracers; and a ring of wizardry. Opening one door seals the two other shut; there is no way to get two or all three magic items.note Well, there is a way, but that involves editing the data code of the save file... you're not supposed to do that. Player Character Calculus: The series put an unusual spin on this: at the start of each game, you can create a party of four customizable PCs, but the actual limit is six, as you can additionally recruit up to two predefined NPCs you meet on your adventures. Poisoned Weapons: The drow Shindia Darkeyes fights with poisoned daggers. Poison Mushroom: In EotB1, some apparently useful potion flasks contain poison. And in this game, it's not easy to identify them early on (although Save Scumming helps). Pressure Plate: Full of them. Puzzle Boss: In the first game, Xanathar the beholder can be easily defeated by using a wand to push him into a spiked trap. He can be killed by regular means as well, though. Resurrection Sickness: As the games are based on AD&D, the Raise Dead spell can revive characters, but with only 1 hit point, requiring further healing magic to bring them to full health. Also, their food bar is automatically emptied, meaning they start starving if they don't eat immediately after resurrection. Save Scumming: The games can easily be abused through this method, beyond just resetting an encounter that went badly. First, since it is a game based on Dungeons & Dragons, gaining a level bring a random amount of Hit Points. By keeping a close eye on the characters' experience score, you can save right before a fight that will bring enough XP to level up; if the HP "roll" is not high enough, you can reload and retry until getting the maximum. This can also be exploited to identify unknown magic items. You can taste a potion or fire a charge from a wand to see what it does, and then (especially if a potion proves to be Poison) reload the game, thus not having wasted a dose or wand charge. Scaled Up: Dran Draggore turns out to be a dragon. Schmuck Bait: If you're warned to not enter the room full of awesome magical items... you shouldn't. So Long, and Thanks for All the Gear: Played completely straight with one character in EotB2 . A halfling you meet early in the game is locked up, and you have the option to free him. However, the first time you camp with him in the party, he runs off and takes, not the equipment he's carrying specifically, but some of the gear of the sleeping party members. Well, you should have expected it; he's a Thief (the Character Class). He even leaves a note basically invoking this trope by name. You can prevent this by dropping all of your items on the floor before sleeping, leaving him with nothing to take when he leaves. Or you can just maneuver so that he gets killed by monsters; he's not going to steal anything if dead, and you can still profit of his inventory space. Status Buff: Both Mages and Clerics have spells like this. They are quite useful, though for the most part with very short duration (except for the aforementioned Stoneskin). Aid is a good cleric spell to absorb damage. Especially handy if you know you're going to get hurt, like by jumping down a pit. Haste is probably the best choice on the mage side, especially since a single casting can affect the whole party. Shield is very useful against enemies using Magic Missiles; problem is, it only affects the caster, thus it may force you to put the Squishy Wizard in the front row to protect the whole party. In the first game only, Stoneskin can make your whole party nearly invulnerable to physical attacks. No wonder it got removed from the later games. Stock Femur Bone: Most of the bones found in EotB2. They can be used as clubs. Take Your Time: The games even inform the player about the amount of time that had passed while the party is resting, but no matter how many days you spend sleeping, the Big Bad never quite get around to completing his nefarious plans. True Sight: The True Seeing spell allows you to see through the many secret illusory walls dispersed through the mazes in the games. Turn Red: Literally for Dran Draggore, who happens to be a red dragon. Turn Undead: A power for the cleric or the paladin, along with the D&D rules. In EotB1 it is an automatic function, as long as the character is holding a holy symbol. Starting with EotB2, it becomes an action like any spell-casting, though not limited in use. Undignified Death: Tod Uphill in the first game died by falling down into the sewer. He is not happy about this if the party resurrects him. Insal the Halfling thief. After freeing him from his cell, he robs you the next time you rest. At one point, you have the option to help out a beholder stuck inside a circular hole on the ceiling. If you choose so, it thanks you... and then immediately attacks the party because it's hungry. Universal Poison: Every poisons in the games, whether from monsters or potions, work the same way: the poisoned character lose 5 hit points at regular intervals, until death or healing. The first game has the Detect Magic spell to determine whether an item is magical, but doesn't reveal what powers a magic item has, until you use one of two "oracle" places deep in the dungeon that are powered by black spheres. The second game adds an Improved Identify spell for this purpose. Unwinnable by Mistake: From EotB2, in the level with flying cobras and gas spores, you can encounter a priest of Darkmoon lost in the maze and standing on a pressure plate. If you kill him, the door to the room closes with no way to open it, forcing you to reload the last saved game. There is a way to keep the door open, however (to get the treasures next to the priest), by luring beforehand a monster into the frame and paralyzing it or turning it to stone; the door then can't close even if the pressure plate is released. This clearly wasn't anticipated by the makers, though, since the whole level gets wonky afterward. Notably, the monsters now all look like priests (but still makes flying cobras sound and can poison you). Not quite a Game-Breaking Bug as you can still continue playing, but if you've done so before solving the riddle for exiting this level — which is done by feeding various items to a series of magic mouths in the walls — then you are stuck because the magic mouths are no longer there. Violence Is the Only Option: In the Temple of Darkmoon, if you try to enter the closed doors, the two priests will warn you to stop. Since you can't progress in the game if you obey, you have no other choice but attacking the priests. Voice with an Internet Connection: Khelben Blackstaff, in the second game. After hiring the party to investigate the Temple of Darkmoon, he uses his magic to contact them regularly and give some piece of advice. Warp Whistle: The games feature magic portals that are activated by special "stone" items, and transport you elsewhere in the dungeon. Each portal has carvings of seven items along its frame, with the eighth empty spot indicating which item should be used. EotB1 has plenty of them, while EotB2 only has one. They are usually two-way, however EotB1 has one portal where the destination spot and the return spot are split and in separate places. This can become a trap since it sends you to a deeper level that you may not be ready to explore yet. Warp Zone: EotB1 has a room sporting five of the aforementioned magic portals in the same place. A Winner Is You: The MS-DOS version of the first game is notorious for its anticlimactic ending. After defeating Xanathar, a simple message box appears, describing the party's rescue and the following celebrations — and then the game boots you back to the DOS prompt. Wizard Needs Food Badly: The characters need to eat or start losing hit points. This is not so much of an issue though, as the game gives you more than enough rations to last until your cleric can learn a very useful Create Food spell, that instantly fills the entire party's hunger bars. The first game actually contains enough food to make it through without the Create Food spell — although adventuring without a cleric is a bad idea for other reasons. You All Meet in an Inn: How the third game begins, complete with a dubious cloaked individual offering the party a job.